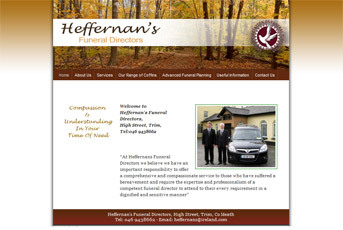 Digital Door developed a new website for Heffernan’s Funeral Directors of Trim in County Meath. They wanted to have a website that portrays the professionalism and compassion of their Undertaker Business. Their website also had to be search engine friendly and one that would give them a prime position in Google’s first page when people search for “funeral directors in Meath”. Click here to visit Heffernans Funeral Directors website.